Journal of Veterinary Emergency and Critical Care 2012;22:558-563. Hypoglycemia is a serious and frequent complication of insulin treatment, with over a third of human diabetic patients experiencing hypoglycemia-induced coma sometime during their diabetic lifetime (1). In veterinary practice, hypoglycemia is a well recognized complication of insulin treatment, but the true incidence of hypoglycemic events in diabetic dogs or cats is not known (2). One reason for this is related to the fact that, at least until recently, home blood glucose monitoring has played only a small role (if any) in the management of most diabetic animals (3). Therefore, as long as the diabetic dog or cat was not displaying clear overt signs of weakness or seizures, hypoglycemia would not be detected. However, it is likely that hypoglycemia is a very frequent complication associated with insulin treatment in both dogs and cats. Recent studies revealed that 35% of cat owners and 40% of dog owners report at least occasional hypoglycemic episodes (4,5), a rate that is quite frightening when we consider the potential consequences. Even when frequent home blood glucose monitoring is being used to help improve diabetic regulation, use of continuous interstitial glucose monitoring have revealed a high incidence of asymptomatic hypoglycemia in these patients (6,7). Glucagon is secreted from the alpha cells of the islets of Langerhans. It acts to raise circulating glucose concentrations by increasing the rates of both glycogenolysis and gluconeogenesis in the liver (8,9). 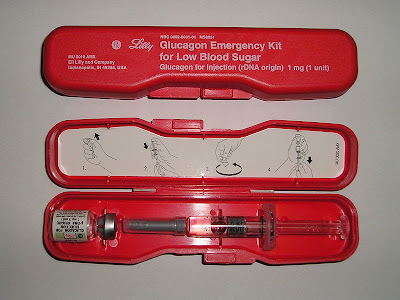 Due to its rapid hyperglycemic effects, parenteral glucagon has successfully been used to treat impending or current hypoglycemia in human diabetics (10,11). It is effective and practical in home treatment, especially when vomiting or nausea prevents the patient from eating. Emergency glucagon kits for intramuscular or subcutaneous use are commercially available (12,13). In veterinary medicine, glucagon is not routinely provided to owners of insulin-treated pets, despite the serious concerns surrounding hypoglycemia in both dogs and cats. Traditionally, treatment of insulin-induced hypoglycemia has been limited to providing a source of carbohydrates in the form of food, or applying a dextrose solution to the buccal mucosal (2). The aim of this study by Zeugswetter et al (14) was to investigate the effects of a subcutaneous glucagon bolus injection on glucose, insulin, ACTH and cortisol secretion in healthy dogs. The main aims of this study was to determine if subcutaneous glucagon administration would reliably increase blood glucose concentrations, which is of practical importance since diabetic pet owners are used to giving subcutaneous injections. Objective of Study – To compare the effects of subcutaneous (SC) and intravenous (IV) glucagon on glucose concentrations, and insulin and cortisol secretion. Design – Prospective randomized 3-way crossover study. Animals – Five healthy beagles. Interventions – Diabetes mellitus and adrenal insufficiency were excluded by repeated glucose and fructosamine measurements, urinalysis, abdominal ultrasonography, and ACTH stimulation tests. Blood samples were collected before and after the SC and IV injection of 1 mg commercially available synthetic glucagon and analyzed for insulin-like immunoreactivity, glucose, ACTH and cortisol concentrations. The results were compared with those obtained after the SC injection of 1 mL saline (placebo). Measurements were performed over a period of up to 3 hours. Measurements and Results – SC glucagon significantly increased glucose and insulin (P < 0.001 and 0.043, respectively). Peak glucose concentrations were observed after 20 minutes and were lower than after IV injection (mean ± SD: 6117.1 ± 19.8 mg/dL versus 167.6 ± 14.4 mg/dL; P = 0.001). The route of application had no significant effect on insulin (peak concentration: median: 12 μU/mL versus 28 μU/mL; P = 0.151). SC glucagon did not increase cortisol or ACTH concentrations at any time point of observation (P > 0.05). Aside from somnolence, no adverse events were recorded. Conclusions – SC glucagon has the potential to be used as a simple and safe test in diabetic animals, but is of little use in animals with suspected corticotrophic insufficiency. The hyperglycemic effects are significant, implying that the commercially available human emergency kit could be useful in the home treatment of canine hypoglycemic emergencies. In this study (14), the investigators were able to document a significant and rapid rise in blood glucose concentrations following a single subcutaneous bolus of glucagon, with peak glucose concentrations occurring after only 20 minutes of injection. These findings are comparable to reports in human patients, which show rapid absorption of glucagon following subcutaneous administration (). Based on this report, it appears that the commercially available human emergency kit could be useful in the home treatment of canine or feline hypoglycemic emergencies. However, it would still be useful to evaluate the use of glucagon in dogs and cats suffering from diabetes mellitus, especially in those experiencing frequently bouts of hypoglycemia. Overall, as discussed very nicely in the accompanying editorial by Dr. Stijn Niessen (15), this study demonstrates that glucagon may be the “life saving trick” that we have been missing when dealing with a hypoglycemic dog (or cat). Providing these glucagon emergency kits to owners of our diabetic patients would likely help treat serious bouts of hypoglycemia. In addition, having such an "antidote" available to the diabetic pet owner may lessen the anxiety and worry about the risk of hypoglycemia in these animals on insulin treatment. Pramming S, Thorsteinsson B, Bendtson I, et al. Symptomatic hypoglycaemia in 411 type 1 diabetic patients. Diabet Med 1991;8:217-222. O'Brien MA. Diabetic emergencies in small animals. Vet Clin North Am Small Anim Pract 2010;40:317-333. Cook AK. Monitoring methods for dogs and cats with diabetes mellitus. J Diabetes Sci Technol 2012;6:491-495. Niessen SJ, Powney S, Guitian J, et al. Evaluation of a quality-of-life tool for cats with diabetes mellitus. J Vet Intern Med 2010;24:1098-1105. Niessen SJ, Powney S, Guitian J, et al. Evaluation of a quality-of-life tool for dogs with diabetes mellitus. J Vet Intern Med 2012;26:953-961. Davison LJ, Slater LA, Herrtage ME, et al. Evaluation of a continuous glucose monitoring system in diabetic dogs. J Small Anim Pract 2003;44:435-442. Affenzeller N, Thalhammer JG, Willmann M. Home-based subcutaneous continuous glucose monitoring in 10 diabetic dogs. Vet Rec 2011;169:206. Connolly CC, Ivy RE, Adkins-Marshall BA, et al. Counterregulation by epinephrine and glucagon during insulin-induced hypoglycemia in the conscious dog. Diabetes Res Clin Pract 1996;31:45-56. Dobbins RL, Connolly CC, Neal DW, et al. Role of glucagon in countering hypoglycemia induced by insulin infusion in dogs. Am J Physiol 1991;261:E773-781. Hartley M, Thomsett MJ, Cotterill AM. Mini-dose glucagon rescue for mild hypoglycaemia in children with type 1 diabetes: the Brisbane experience. J Paediatr Child Health 2006;42:108-111. Haymond MW, Schreiner B. Mini-dose glucagon rescue for hypoglycemia in children with type 1 diabetes. Diabetes Care 2001;24:643-645. Glucagon for Injection (rDNA origin). Product information. Eli Lilly and Company. Treating severe lows with glucagon. www.myhumalogchild.com. Eli Lilly and Company. Zeugswetter FK, Schornsteiner E, Haimel G, et al. Metabolic and hormonal responses to subcutaneous glucagon in healthy beagles. J Vet Emerg Crit Care (San Antonio) 2012;22:558-563. Niessen SJ. Glucagon: are we missing a (life-saving) trick? J Vet Emerg Crit Care (San Antonio) 2012;22:523-525.